Sports Betting Sweeps March Madness | Econsult Solutions, Inc. Depending how yesterday’s games went, you may already be mathematically eliminated from winning your office bracket. But given the fact that the odds of finishing the tournament with a perfect bracket is anywhere between 1 in 128 billion or 1 in 2.4 trillion (depending on how you calculate it), odds are you had at least one loss yesterday. To put the odds of having a perfect bracket into perspective, the odds of winning Saturday’s $625 million Powerball jackpot is 1 in 292 million. From an economic impact perspective, March Madness has traditionally been viewed as having a negative impact through lost worker productivity. This includes calling in sick to watch the games, people coming in late after staying up to watch West Coast games, watching the games at their desk, and filling out and tracking their brackets. This time adds up. In 2016 it was estimated that more than $4 billion was lost in worker productivity during the opening weekend of the tournament. For the eight states, Pennsylvania included, that have legalized sports gambling, March Madness now means something more. It means additional, valuable tax revenue for state and local governments. According to a recent survey from the American Gaming Association (AGA), 47 million Americans, 1 out of every 5 adults, will place a bet on March Madness. This includes the 40 million people that will fill out one of the 149 million brackets, as well as the 18 million people who will place a bet at a sportsbook, online, or with a bookie. Of those 18 million, 4.1 million will place a bet at a casino sportsbook or using a legal online app. It is estimated over $8.5 billion will be wagered on March Madness this year. Approximately $4.6 billion will be wagered in office and other bracket pools, while $3.9 billion will wagered at a sportsbook, online, or with a bookie. Just like last month’s Super Bowl, this represents the first post-PASPA March Madness. Locally, college basketball fans in Delaware, New Jersey, and Pennsylvania can legally place a bet. In Pennsylvania bettors have eight options, while in New Jersey there are 10 sportsbooks, eight in Atlantic City and two in the rest of the state. New Jersey gamblers have the added benefit of also being able to place wagers online and from their phones. The first legal sportsbook, outside of Nevada, opened in New Jersey in June of 2018. Since then, nearly $2 billion has been wagered in the Garden State, generating over $125.7 million in sports betting revenue and over $14.1 million in tax revenue. Online and mobile gaming has proven to be especially popular in New Jersey. In February, online and mobile wagers accounted for four times the wagers made in person – $258.9 million versus $61.5 million. The percentage of revenue from online and mobile wagers has increased every month since it began. Pennsylvania’s first sportsbook opened at Hollywood Casino at Penn National in mid-November. In the three and half months that sports wagering has been legal in Pennsylvania, bettors have wagered $81.1 million, generating $7.1 million in revenue and over $2.5 million in state and local taxes. Excluding online and mobile, wagering at sports books in Pennsylvania has been lagging neighboring New Jersey. In January, sportsbooks in New Jersey took in over 2.5 times the bets as sportsbooks in Pennsylvania – $80 million versus $32 million, and in February New Jersey saw nearly twice the bets of their Pennsylvania counterparts – $61.5 million versus $31.5 million. Pennsylvania has the distinction of being the online state that has authorized online sports betting but has yet to implement it. Online sports betting in Pennsylvania was technically approved in 2017 when lawmakers passed legislation that legalized sports betting at the state’s casinos if New Jersey was successful in its challenge of the PASPA. And if New Jersey’s experience is any indication, the Commonwealth left significant revenue on table from the Super Bowl and is now forgoing additional significant revenue from March Madness. 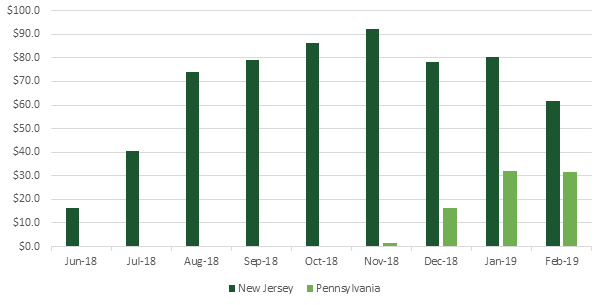 In addition to lack of online and mobile betting, another reason that Pennsylvania is significantly lagging New Jersey is due to the difference in the taxes and fees in Pennsylvania versus New Jersey. Unlike other types of casino games, the margins on sports gaming are thin and the higher fees in Pennsylvania may be leading some operators to opt out or not invest as much as their New Jersey counterparts. In Pennsylvania, a sportsbook is required to pay a $10 million license fee and a state tax of 34% of gross gaming revenue and a local tax of 2% of gross gaming revenue, while in New Jersey the license fee is $100,000; the state tax on bets made in a physical sports book are 8.5% and for mobile and online bets the tax rate is 13% on gross gaming revenue; and the local tax is 1.25% of gross gaming revenue. Given the fact that both New Jersey, and more so Pennsylvania are still in their ramp-up periods, how much can each state expect from March Madness? Gambling industry officials in New Jersey predict that the volume of bets in New Jersey placed on the tournament will surpass the Superbowl which was $320 million. Other industry experts place the estimates much lower between $50 million and $85 million for New Jersey and around $10 million for Pennsylvania. It is important to note that if online and mobile wagering were legal in Pennsylvania, the state’s estimate would be much higher. One thing that could help Pennsylvania’s numbers for the tournament would be if Villanova made another run deep into the tournament. Stay tuned. Econsult Solutions, Inc. (ESI) has worked extensively on casino and gaming industry projects, with clients spanning both public and private sectors. We have decades of experience in the gaming industry, which keeps ESI at the forefront of the trends and helps us understand the challenges the industry faces. Learn more about our capabilities by clicking here. ESI was retained by the Pennsylvania Legislative Budget and Finance Committee in 2014 to analyze the conditions of casino gaming in Pennsylvania, as well as the future of gaming as a whole. Click here to learn more and read the report. 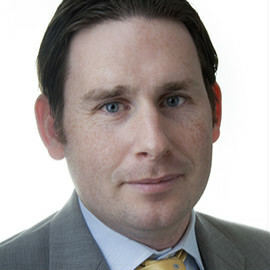 Dr. Daniel Miles leads economic analysis across a variety of sectors and industries. Additionally, Dr. Miles is the Chief Economist of ESI Thoughtlab. Prior to joining ESI, Dr. Miles was a Senior Economist at Oxford Economics where he led a multinational team of economists based in New York, Belfast, and London. Dr. Miles was interviewed by 6abc Reporter Dan Cuellar on the topic of economic impact of March Madness and sports better. Click here to watch! Spectrum Gaming Sports Group, Econsult Solutions to Project Economic Impacts of Sports Betting for States, Operators ESI in the News International Soccer Market Kicks Off in the U.S.